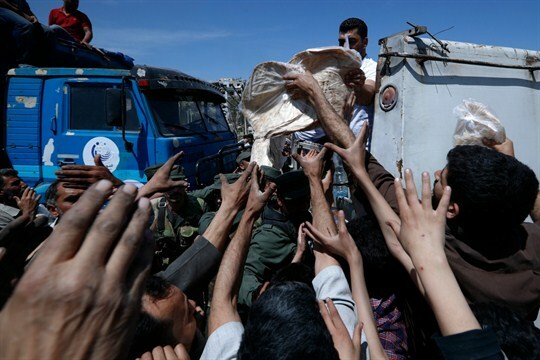 Syrian authorities distribute bread, vegetables and pasta to residents of Douma, the site of a suspected chemical weapons attack in Syria, April 16, 2018 (AP photo by Hassan Ammar). Ten years ago, the Sri Lankan military carried out a violent final offensive against the Liberation Tigers of Tamil Eelam, a rebel group with a long history of atrocities. The offensive, which ultimately resulted in the end of the war, involved the brutal killings of thousands of civilians—acts that were documented in real time by journalists and United Nations officials. Over the past decade, the U.N. has tried to change how it responds to crisis situations so as to promote human rights and the protection of civilians. For this week’s Report episode of the podcast, Richard Gowan talks with Robbie Corey-Boulet about the successes and failures of that reform effort, and why the U.N. has failed to stop new outbreaks of violence from Syria to Myanmar and beyond.